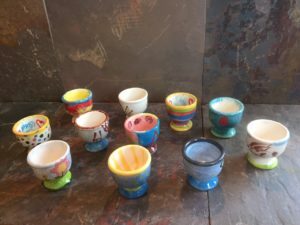 Pottery Painting is lots of fun, relaxing and is perfect for family groups, hen dos or birthday parties (young & old!). 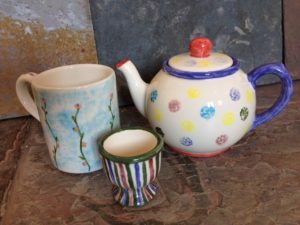 Pottery Painting Sessions are bookable 10-12 or 2-4 Thurs-Sun (less availability some weeks depending on our schedule). We need at least 4 people to run a session and can seat up to 22 people. If you are a small group or on your own, it is always worth contacting us to see if others have booked. A basic briefing is given and lots of help and encouragement is always on hand should you need it. Pottery painting costs £6.00 per person and the cost of whatever you choose to paint from our range (from £4.75 to £10.00). Once you have finished your pottery it needs to be glazed and fired before it is finished. We fire as often as is economical. Pottery pick up is possible if you live locally or a firing is due while you are here. If not then delivery is a total cost of £16.50 to one UK address. If some of your party are doing a pottery trial class as well, then the delivery cost can be combined across both activities. Well-behaved dogs are welcome in our gallery space as long as the pots stay on the shelves and the dogs on the floor! PLEASE NOTE: There will be no pottery trial classes or pottery painting sessions on 15th June, or between 20th – 29th June & times/availability may vary on special event days/weekends.